During Access cavity preparations care must be taken not to perforate and make sure that there are no canals missed. This can be done by properly reading the X-ray to make sure that there are no additional root canals or Roots and the locations of which should be kept in mind to expose them during access cavity preparation. There will be many changes in the location of the access openings and this image shows us the relative position of the access openings taken by studying hundreds of canal positions. So it might be different in every tooth and you have to be ready to make the necessary changes according to your case. 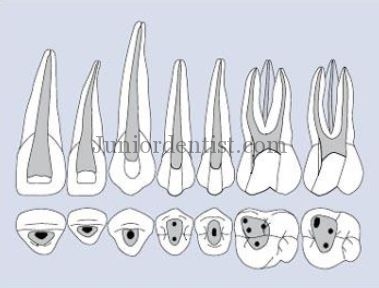 As we say every tooth is not the same it holds same for the access cavity preparations as well. do you have shape of access cavity preparation for mandibular teeth? sir do u have access cavity preparation for maxillary first molar?